The Pro Bowl has been on shaky ground for years now. and it's been whispered that this weekend's could be the last. The physicality of football simply doesn't allow for an All-Star game that can simultaneously be a true representation of the sport and offer a low probability of injury for the game's best. The result has been lackluster play, an inaccessible game, and what amounts simply to millionaires getting paid to hang out in Hawaii. Not surprisingly, it is the weakest of all of the major sports All-Star games. 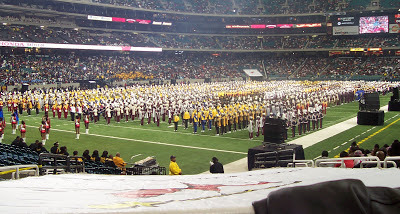 Typically during the same weekend, the Georgia Dome comes alive as eight HBCU marching bands take center stage in the Honda Battle of the Bands. Marching bands are inextricably linked to football, and while this doesn't always ring true at the professional level, this would be an excellent change for the NFL to get back to this pairing. The Pro Bowl could downsize to a skills competition - the most attractive part of the weekend anyway - and hold it in Atlanta, a far more accessible city on the Sunday before the Super Bowl. The day before, the NFL could throw a bit of muscle behind the Honda Battle of the Bands, making it the official "halftime" between conference championships and the Super Bowl and televise it, either on a usual network partner or on NFL Network. It would fill the void left by the Pro Bowl, should the NFL ever take it out back and shoot it, add entertainment unique to the NFL under their corporate banner, extend the Pro Bowl/Super Bowl week festivities, and provide an accessible, enjoyable experience for fans who have otherwise been left in the cold.